Taiji Japan is a tiny town with a dark secret. Each year from September to May Japanese fisherman congregate to the area to exploit the yearly migration path of the bottle nosed dolphin. Over 20,000 dolphins are slaughtered during this time. Japanese fishermen heard hundreds of dolphins at a time into hidden shallow lagoons similar to the one featured in the award winning documentary, The Cove. Bottlenose dolphins, especially ones that look like Flipper, are pre-selected by trainers and sold off for upwards of $200,000 to marine mammal parks around the world, where they will remain in captivity performing as circus acts. After the trainers and spectators have left, a large yellow tarp is pulled over the shallow lagoon to shield what the fishermen do next from public eye. What they do is nothing short of a bloody ghastly massacre. One by one each dolphin is impaled with a sharp metal rod just behind the blow hole. The gruesome slaughter is so bloody the waters of the cove turn red with dolphin blood. Fishermen drive huge wooden sticks into the dolphins gaping wound to mitigate against the amount of blood the dolphins spill out into the cove. The following depicts one person’s first hand look at one of these particularly brutal slaughters. The butchered dolphins are later used for food, but the Japanese government has intentionally sheltered people from the dangers of eating them. Consumers of dolphin meat run the risk of mercury poisoning due to high levels of the toxin within the animals. Adding to the danger, much of the pricier whale meat they purchase is actually mislabeled toxic dolphin meat. While the Japanese government defends dolphin hunting as part of their cultural heritage, this tradition has serious health effects on its own people. Animal rights activists such as Rick O’ Barry have been fighting for decades to get this slaughter shut down to no prevail. This year Hacktavists from across the globe have stepped in to lend a hand to the cause and support efforts made by Rick O’ Barry and Sea Shepard group, Cove Guardians. 1. Team Anonymous launches #OpKillingBay in press release on AnonInsiders.net and releases following video. Their objectives, goals, and targets are outlined and posted in this strategic brief. 1. In an open letter, Team Anonymous reaches out to infamous marine animal conservationist activists Sea Shepard to extend their hand in helping the group shut down the Taiji Dolphin Slaughter. Sea Shepard and it’s subset group Cove Guardians, as well as Rick O’Berry have been fighting on the front lines for years trying to raise awareness and expose the truth behind the yearly Japanese “tradition”. 1. #OpKillingBay Twitter Storm initiated at 6:00PM Central Time. A list of targets to which the tweets should be aimed are released. Those on the list include those who either financially back or otherwise play a role in facilitating the slaughter, as well as various media outlets. The #OpKillingBay hashtag is used to signify the public support of the Anonymous Operation and has been one of the most enduring this year. 1. Root Security announces they will join Team Anonymous in #OpKillingBay in the following video. Warning: the video is extremely graphc. 1. #OpKillingBayTwitter storm launched. Over 200 targets consisting of news outlets and supporters/ enables of the slaughter were demanded to either dedicating more coverage to the slaughter or stop their involvement. Twitter storms have been a successful way of not only addressing certain people, but also to raise public awareness on a particular event or subject matter. 2. 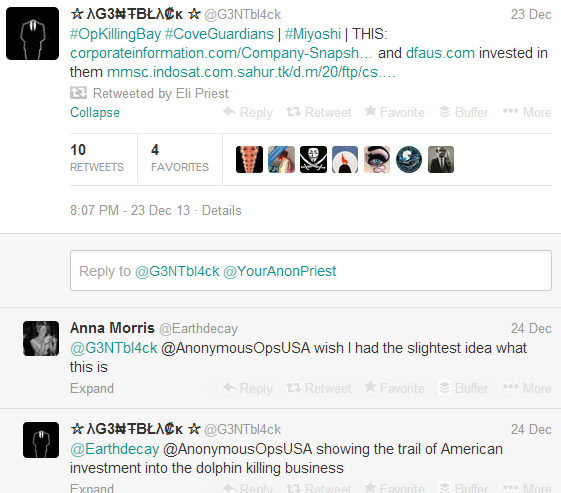 Team Anonymous claims to make large donation to Sea Shepard using the stolen information. 2. 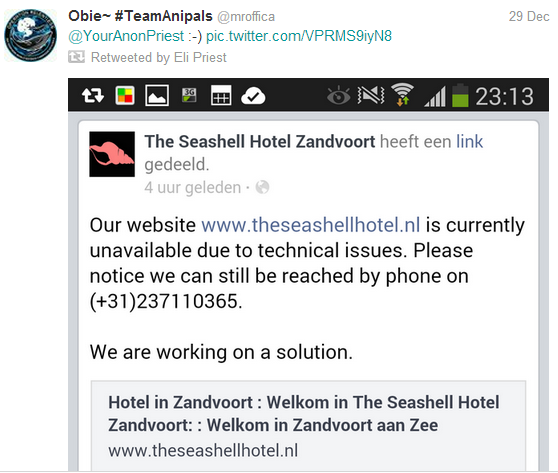 Team Anonymous brings down website http://www.arle.com for being a financier to the yearly Taiji Dolphin Slaughter. ARLE Capital Partners, an international private equity manager managing €2bn of investments. 2. Team Anonymous announces Dolphin Quest Database Hack and Dump. 1. 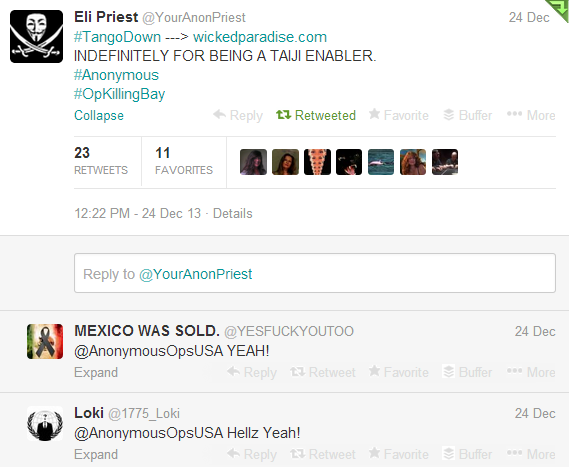 Team Anonymous downs Wickedparadise.com indefinitely for supporting Taiji dolphin slaughter. 2. 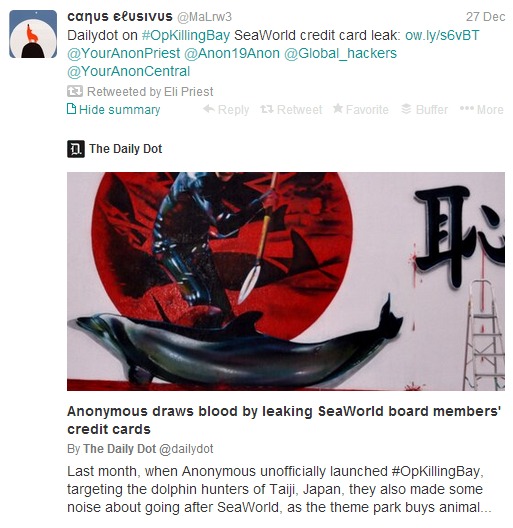 Team Anonymous announces Sea World and WAZA email leak. Click here for information on WAZA’s role in Taiji dolphin slaughter. 1. The latest and possibly the most anticipated announcement by Team Anonymous is that they will be hacking into various networks and broadcasting Black Fish over enabled billboards in Tokyo, Japan’s giant on New Years Eve. In retaliation for the efforts of Sea Shepard and supporters thereof, Japan militia have offered the following declaration of war calling for the death of Sea Shepard crew and, in particular, Sea Shepard founder Paul Watson. Members of the extreme Japanese militia are even turning against their own. Last year the brother to the head of the Japanese Fishery Union was assassinated for his public support of considering changes to Japan’s tradition of slaughtering marine life. The head of the fishery union himself shared his brother’s beliefs he was also assassinated over the weekend. Although the exact reasoning behind his murder are not clear, many believe the reasons were one in the same. This is disheartening news to supporters of #Opkillingbay, Sea Shepard, Cove Guardians and people around the world who’s hearts bleed for these dolphins. Conversely the 2 assassinations and increasing violence toward the non-violent Sea Shepard organization may have a negative effect on their efforts and lose support from the Japanese public. It’s certainly a saga many are anxious to see unfold. The sooner the better. The slaughter continues on until March and l will be watching, as many of you are as well.